Dr Abi Abraham is recognized nationally as well as internationally as an expert in the field of nephrology and kidney transplantation. 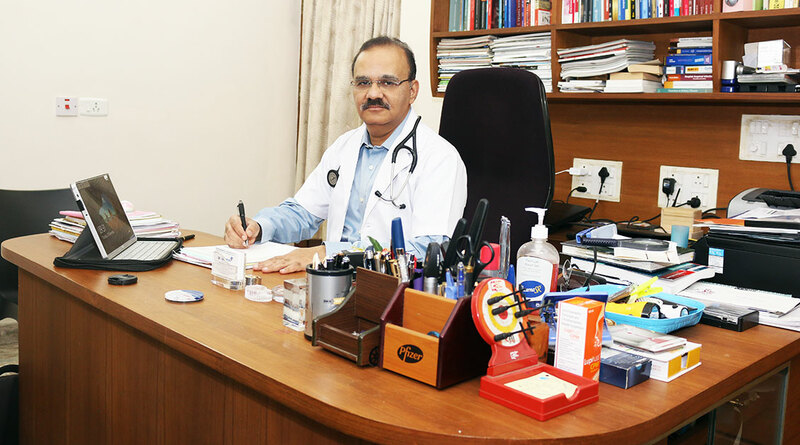 After a brilliant academic career both as an undergraduate and postgraduate student from the prestigious Christian Medical College (CMC), Vellore, he worked as a faculty there for 7 years. As a core faculty member he was actively involved in patient care, training of postgraduates and research. His publications in optimizing immunosuppression, post-transplant infections, lupus nephritis (SLE) and electrolyte disorders have been widely cited and helped the department in adopting various strategies. He was in involved in the care of more than 1000 renal transplants which were performed at the centre when he was there and the management of complex cases referred to CMC Vellore from the rest of the country. He left CMC as Associate Professor and since 2002 he has been with Lakeshore Hospital. He set up the department of Nephrology and Renal Transplantation (along with the transplant surgeon) in VPS Lakeshore. Of nearly 850 renal transplants (live donor as well as deceased donor) done at VPS Lakeshore till now,550 patients had been under his care. Under his leadership, VPS Lakeshore has emerged as a leader in renal transplantation particularly for recipients with complex problems (sensitized, elderly as well as paediatric) attracting patients from the entire state as well as neighbouring states, Maldives, Middle East and few African countries. The centre has also performed combined kidney and liver transplant as well. His other areas of expertise include critical care nephrology, reducing the progression of Chronic Kidney Disease (CKD), Lupus Nephritis and Vasculitis and fluid and electrolyte disorders. Under his leadership, unit performs the maximum number of Continuous Renal Replacement Therapy (CRRT) in the state. He has been awarded fellowships of Royal College of Physicians Glasgow and Indian Society of Nephrology. March 1986: MBBS from Christian Medical College & Hospital Vellore (University of Madras). March 1992: MD (General Medicine) from Christian Medical College & Hospital Vellore (Dr.MGR Medical University). March 1995: DM (Nephrology) from Christian Medical College & Hospital Vellore (Dr.MGR Medical University). June 1995: DNB (Nephrology) from National Board of Examinations. Secretary, Nephrology Association of Kerala (NAK). Executive committee member, Nephrology Association of Kerala (NAK). 1983- Dr. JC David Memorial Gold Medal in Pharmacology. 1983- Microbiology Prize for highest aggregate marks. 1984- Anil George Memorial Award for 1st rank in II MBBS. European Renal Association- European Dialysis and Transplant association (ERA-EDTA). Indian Society of Peritoneal dialysis. MA Abraham, A Korula, KN Arun, K Jayakrishnan, GT John, PP Thomas, Ck Jacob. Treatment of diffuse proliferate lupus nephritis. An Indian experience Natal Med J India 1997; 6:273-275. M Abi Abraham, KN Arun, George T John, Paulose P Thomas, Chukka Korula Jacob. Percutaneous biopsy of solitary kidney. Natl Med J India 1998; 5:247-248. D. Mathai, Abi Abraham M, KR John, Mary Jesudasan. MK Lalitha, Molly Thomas, OC Abraham M TJ John. Randomized controlled study of Chloramphenicol Vs ofloxacin in the treatment of enteric fever. A pharmacoeconomic analysis. J Assoc Physicians India 1998; 46:991997. MA Abraham, A Korula, K Jayakrishnan, GT John, PP Thomas, CK Jacob. Risk factors for developing end stage renal failure in patients with diffuse proliferative lupus nephritis. J Assoc Physicians India 1999; 47:862-865. Abraham MA. Severe hyponatremia. Indian J Nephrol 1999; 4:140-6. Abraham MA. Severe hyponatremia. Renal emergencies; pp 7-15. A Ravindra Prabhu, GT John, V Shankar V, PP Thomas, Abi Abraham M, L Jayaseelan, CK Jacob. Effect of donor age on the renal allograft survival. Natl Med J India 2001; 14:18-21. George Tharayil John, Viswanathan Shankar, Abi Abraham Mookanottle, Uma Mukundan, Paulose Punnakkuzhathil Thomas, Chacko Korula Jacob. Risk factors for post-transplant tuberculosis. Kidney international 2001; 601148-1153. Abi Abraham M, Chakko Korula Jacob. Severe hyponatremia: Current concepts (Review article). Natl Med J India. 2001; 14:277-83. John G T, Abraham AM, Mathews MS, Thomas PP, Jacob CK. Nocardiosis in tropical renal transplant recipients Clin Transplant 2002: 16:285-289. Abraham MA, Thomas PP, John GT, Job V, Shankar V, Jacob CK. Efficacy and safety of Low dose Ketoconazole (50 mg) to reduce the cost of cyclosporine in renal allograft recipients. Transplantation Proceedings 2003; 35: 215-216. George Tharayil John, Viswanathan Shankar, Girish Talaulikar, Abi Abraham Mookanottle, Paulose Punnakkuzhathil Thomas, Chacko Korula Jacob. Epidemiology of systemic mycosis among renal transplant recipients in India. Transplantation 2003; 75- 1544-1551. Randomized controlled study of chloramphenicol Vs ofloxacin in the treatment ofenteric fever (Rs. Two Lakhs from Hoechst AG-1991). Efficacy & Safety of low dose Ketoconazole (50mg) in reducing the cost of cyclosporine in renal allograft recipients (Rs. Seventy five thousands (Rs 75000/-) from CMC Research fund).